Hang gliding is an air sport or recreational activity in which a pilot flies a light, non-motorized foot-launched heavier-than-airaircraft called a hang glider. 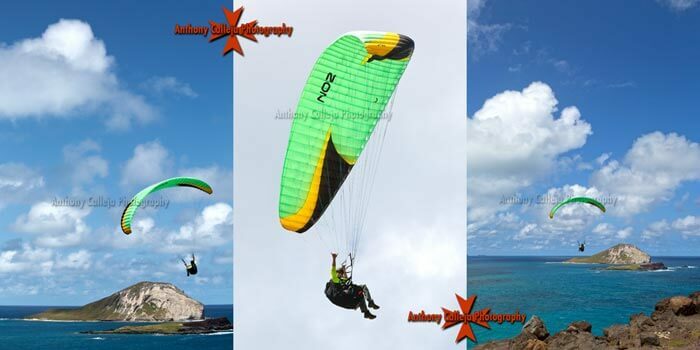 Most modern hang gliders are made of an aluminium alloy or composite frame covered with synthetic sailcloth o form a wing. Typically the pilot is in a harness suspended from the airframe, and controls the aircraft by shifting body weight in opposition to a control frame. Early hang gliders had a low lift-to-drag ratio, so pilots were restricted to gliding down small hills. By the 1980s this ratio significantly improved, and since then pilots can soar for hours, gain thousands of metres of altitude in thermal updrafts, perform aerobatics, and glide cross-country for hundreds of kilometres. The Fédération Aéronautique Internationale and national airspace governing organizations control some regulatory aspects of hang gliding. Obtaining the safety benefits of being instructed is highly recommended. The earliest forms of gliding had existed in China. By the end of the sixth century A.D., the Chinese had managed to build kites large and aerodynamic enough to sustain the weight of an average-sized person. It was only a matter of time before someone decided to simply remove the kite strings and see what happened. Some hang glider flights have been recorded in 875 AD, when Abbas Ibn Firnas attempted a flight in Al-Andalus. Most early glider designs did not ensure safe flight; the problem was that early flight pioneers did not sufficiently understand the underlying principles that made a bird's wing work. Starting in the 1880s technical and scientific advancements were made that led to the first truly practical gliders. Otto Lilienthal built controllable gliders in the 1890s, with which he could ridge soar. His rigorously documented work influenced later designers, making Lilienthal one of the most influential early aviation pioneers. His aircraft was controlled by weight shift and is similar to a modern hang glider. Hang gliding saw a stiffened flexible wing hang glider in 1904, when Jan Lavezzari flew a double lateen sail hang glider off Berck Beach, France. In 1910 in Breslau, the triangle control frame with hang glider pilot hung behind the triangle in a hang glider, was evident in a gliding club's activity. The biplane hang glider was very widely publicized in public magazines with plans for building; such biplane hang gliders were constructed and flown in several nations since Octave Chanute and his tailed biplane hang gliders were demonstrated. In April 1909, a how-to article by Carl S. Bates proved to be a seminal hang glider article that seemingly affected builders even of contemporary times, as several builders would have their first hang glider made by following the plan in his article. Volmer Jensen with a biplane hang glider in 1940 called VJ-11 allowed safe three-axis control of a foot-launched hang glider. On November 23, 1948, Francis Rogallo and Gertrude Rogallo applied for a kite patent for a fully flexible kited wing with approved claims for its stiffenings and gliding uses; the flexible wing or Rogallo wing, which in 1957 the American space agency NASA began testing in various flexible and semi-rigid configurations in order to use it as a recovery system for the Gemini space capsules. The various stiffening formats and the wing's simplicity of design and ease of construction, along with its capability of slow flight and its gentle landing characteristics, did not go unnoticed by hang glider enthusiasts. In 1960-1962 Barry Hill Palmer adapted the flexible wing concept to make foot-launched hang gliders with four different control arrangements. In 1963 Mike Burns adapted the flexible wing to build a towable kite-hang glider he called Skiplane. In 1963, John W. Dickenson adapted the flexible wing airfoil concept to make another water-ski kite glider; for this, the Fédération Aéronautique Internationale vested Dickenson with the Hang Gliding Diploma (2006) for the invention of the "modern" hang glider. Since then, the Rogallo wing has been the most used airfoil of hang gliders.